(33x33) Mens Vintage 80s Wool Disco Pants! Black, Green, Red, Brown Plaid! 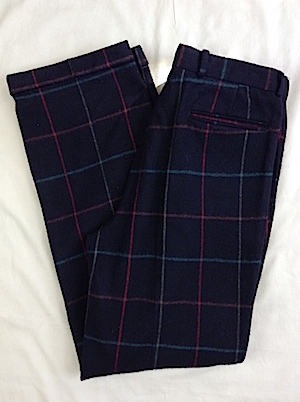 Home > Items just added 4/3-4/17 > (33x33) Mens Vintage 80s Wool Disco Pants! Black, Green, Red, Brown Plaid! 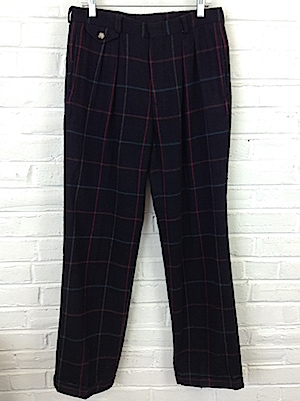 Mens vintage 1980s wool disco pants! 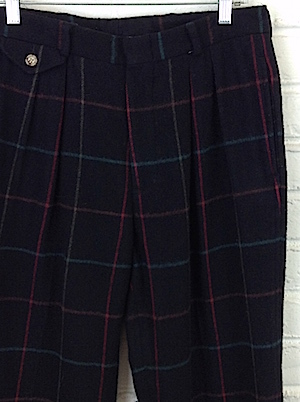 Pleated black, red, brown and green plaid pants. Closes in the front with a hidden tab closure and a hidden interior button for a more secure fit. Two side pockets and stash pocket in the front with a flap and button closure. Has two inner pockets in the back, one with a flap and button closure. Bottom of the pants are cuffed. Pants are not lined on the interior. Tagged by Cesarani. 100% wool. Condition: Very Good. Has some light pilling through out the pants. Does not detract from the awesomeness of these pants.